Deliver seamless, all-encompassing user experiences with Dynamics 365 Field Service. Never miss another order or request, and resolve service issues before they happen. 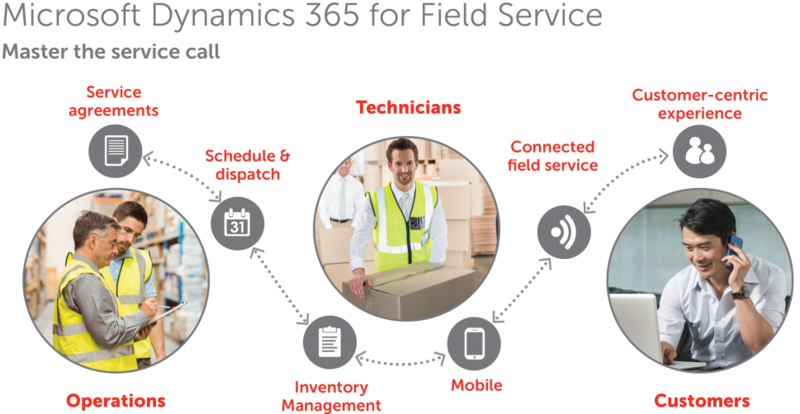 The Dynamics 365 field service technology helps reduce operational costs and deliver unparalleled service. Empower technicians and field service with a 360-degree view of customers and real-time guidance. Improve resolution time and earn great customer trust. Enhance your service experiences by proactively detecting, troubleshooting and resolving issues, allowing you to dispatch technicians only when necessary. Provide customers with self-service portals, updates and technician tracking to ensure a great experience at every level. Drive innovation with an application that is simple to tailor, extent and connect to other apps and services you already use.